Venture into the blistering heart of Iran and you will find your way to Yazd, a city where mosaic streets tremble beneath ancient Persian mystique and contemporary Middle Eastern sophistication. Yazd is the capital of the Yazd Province and home to over 500,000 people. Popular attractions include the Zoroastrian Fire Temple, Amir Chakhmaq Complex and Yazd Water Museum. Get ready to explore the exotic heart of Iran with cheap flights to Yazd. Yazd is home to Shahid Sadooghi Airport (AZD) (also Yazd-Shahid Ayatollah Sadooghi Airport), which is a 20-minute drive from the heart of the city. Yazd is an important hub of Persian architecture. Narrow streets weave between domed buildings, traditional badgirs (windcatchers), and some of the most exquisite mosaic artistry in the world. 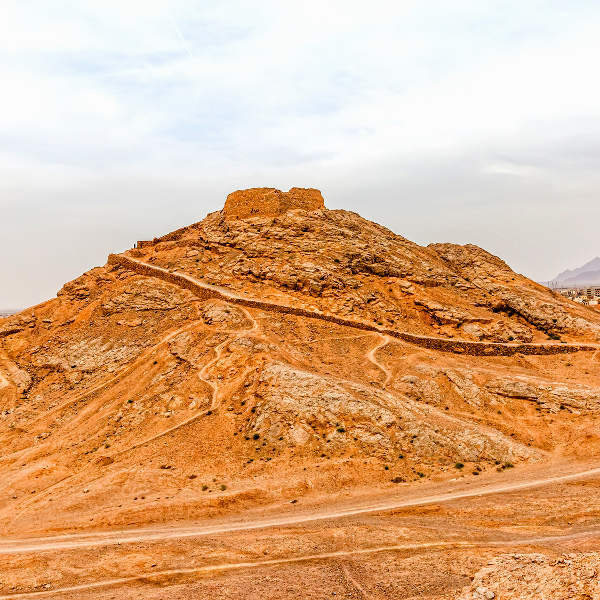 Also known as dakhmas, Towers of Silence were used in the Zoroastrian tradition as a way to cleanse the deceased from demons and impurities before being laid to rest in nearby ossuaries. The holy Atashkadeh (fire temple) of Yazd is one of the most alluring attractions in Yazd. 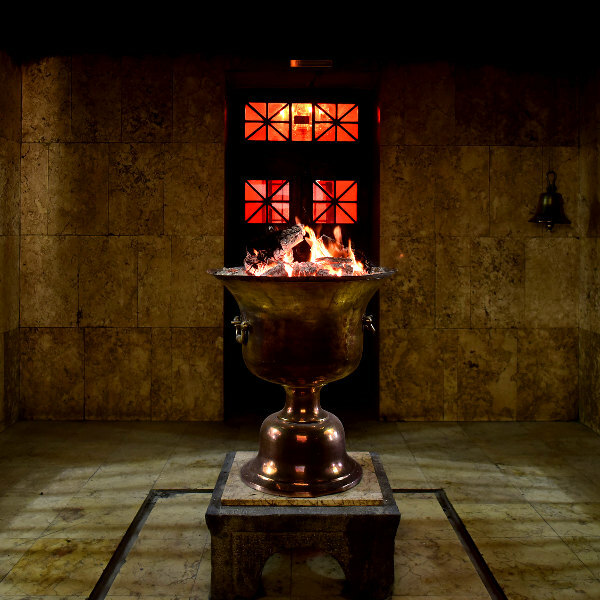 It houses Atash Bahram (Victorious Flame), a sacred flame that is said to have been burning since 470 AD. Yazd experiences a desert climate, with blistering summers, frigid winters, and very little rainfall. Temperatures range from -1 degrees Celsius in winter to 40 degrees Celsius in summer. The best time to visit Yazd is during spring (March to May) and autumn (September to November). The weather is pleasant during these months and the city bustles with activity. Bear in mind that restaurants close during Ramadan (mid-May to mid-June) and public eating and drinking is banned. Notable events include the ancient Festival of Sadeh (usually celebrated in January). For cheap flights to Yazd, the best time to visit is during summer (June to August) and winter (December to February). Sophisticated and relatively untouched by modernisation and the mayhem of the Middle East, Yazd is a little slice of Iranian paradise. It is a city that will enchant you with mosaic masterpieces, seduce you with ancient Persian traditions and charm you with beguiling Middle Eastern magnetism. And although it is one of the oldest cities in the world and celebrated for its traditional badgirs and adobe brick buildings, it is a progressive and liberal city. Lose yourself in the magic of Khan Bazaar; learn about ancient water systems at the Yazd Water Museum of Yazd; or visit Saheb A Zaman Zurkhaneh for a glimpse into a traditional Iranian gym. 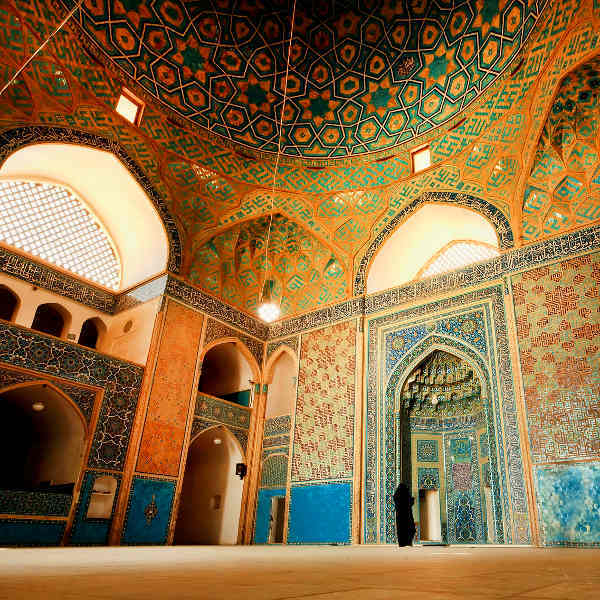 Dazzling tiled domes and minarets tower over narrow alleyways, traditional Persian façades adorned with delicate mosaics and stained-glass windows hide in secret courtyards. The Amir Chakhmaq Complex and Jame Mosque of Yazd are architectural masterpieces. Yazd invites you to lose yourself in the warm embrace of the Iranian desert and discover a world of ancient traditions and scintillating Middle Eastern soul. Compare several airlines and book your cheap flights to Yazd online at Travelstart! Yazd is a safe travel destination. However, using common sense and maintaining a certain level of vigilance is always recommended when travelling to a new city or country. Travel insurance to cover theft and medical expenses is recommended. Iran is a cash only society, so you will need to bring as much cash as you will need. Taxi fare should be agreed on beforehand. Hotels keep guests’ passports, so you will need to bring a copy. There are a number of dubious tour operators who offer cheap, unlicensed home-stay accommodation and tours in Yazd; these are illegal and should be avoided. It is important that you familiarise yourself with the local laws and customs before arriving in Yazd. Proof of yellow fever vaccination is required if you are travelling from an infected country. Vaccinations for hepatitis A & B, typhoid and rabies are recommended. Routine vaccinations include MMR, diphtheria-tetanus-pertussis, meningitis, varicella, polio and influenza.